Let me quickly dispel any doubts about the tone of this review. I would sooner eat my own feces than watch The Lodger again anytime soon. I have watched it twice, because I refuse to review a Doctor Who story on the strength of first impressions, and you can be sure the second helping was even worse. After what has been an incredibly excellent fifth season (for all its faults, Victory of the Daleks was a fun ride and largely successful introductory vehicle to the rebooted race), it is painful to see Matt Smith saddled with drivel like this, and on top of that I find myself trying hard to forget that Gareth Roberts scripted a great story like The Shakespeare Code. Apologists might argue that it seems worse than it is sandwiched in between Vincent and the Doctor and the much-anticipated season finale. But frankly The Lodger is so bad that placing it in between any other stories, no matter how dire -- even lemons like Boom Town and Fear Her -- would amount to little more than trying to polish a turd. Even if I could excuse the paucity of the plot, the fact remains that it is intensely uninteresting. It's worse than pedestrian and plays like a garden variety sitcom, with the monster at the top of the stairs a throwaway, and it's never clear why the Doctor can't go up the stairs right away to deal with the problem other than to satisfy the demands of an empty script. The direction is barely adequate, the design uninspiring; the cast struggle bravely to deliver what is essentially a trivial love story. The set up of the staircase is promisingly sinister, but it delivers manure. 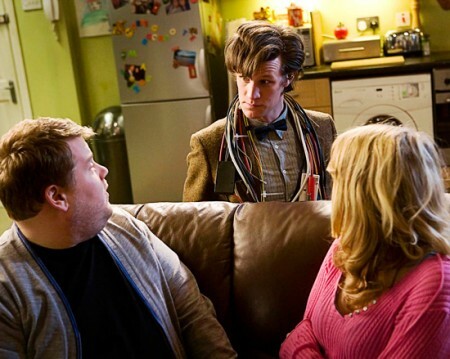 The best thing about the episode is the sight of Matt Smith naked from the waist up. We caught a hint of his sensuous form in The Eleventh Hour when he traded in his "Raggedy Doctor" clothes for the new look, but here we are treated to a much grander spectacle in the context of sharing a flat with someone else, showering, and getting all touchy-feely with Craig. It's quite exciting and warmed me in my nether regions, and even had me wishing Doctor Who was an adult show. If we're going to be subject to soap-sitcom episodes, more skin like this would be appreciated. And if my commentary in this paragraph is a bit off-putting, the story deserves nothing more. The Pandorica can't open soon enough. Oh, I loved it. Fantastic episode, keeping up the quality of the series overall. Only seen it's once so far, but definitely a 4, maybe even a 4.5. Given that you like the abysmal Fear Her, I'm not terribly surprised. But I just knew we couldn't get through an entire season without one lemon. But I can prophesy this: the finale is going to be the best finale of the new series. I think this is one where both you and Mark get it wrong. Not a lemon and not brilliant either. Some great moments, effective portrayal of the Doctor's alienness, some truly effective build up to the question of what's in the attic. All offset for me by the oddity of the Doctor being anxious and careful that what was in the attic might be dangerous – like he's never charged blindly in before. Nonetheless an effective pause and mood change before the big climax, with some delightful moments. Perhaps your biggest problem was that in many ways this was quintessentially English. All offset for me by the oddity of the Doctor being anxious and careful that what was in the attic might be dangerous – like he's never charged blindly in before. As I mentioned myself, that was a glaring weakness catering to the demands of the script. My biggest problem has nothing to do with what's English, but with a "story" that's a complete waste of time. These are the kind of encounters understood to happen off-stage, in between the real adventures of Doctor Who. I don't mind more relaxed pieces before a grand finale, but they have to do a lot better than Boom Town, Fear Her, and The Lodger. Like Mark, I quite enjoyed Fear Her. Not a top episode but by no means a turkey either. I have to agree with Mark and Doug. Not regarding 'Fear Her' by any means, I thought that was a very detached and ridiculous plot with an almost sickly ending. Whilst this series has enjoyed a heavy peppering of humour throughout, it has always been undermined by drama; whereas in this episode, I felt, the opportunity arose for a brief hiatus, before what looks like an overwhelming finale, for just a blatant bit of fun. The drama didn't really matter; Just a comedic romp, as opposed to the more carefully woven and subtle humour presented elsewhere in the season. Admittedly the plot could have used work but, with this coating glaze of, sometimes 'laugh out loud', humour I felt it could be disregarded, like a sponge cake beneath some delicious frosting.